Hello friends and welcome back to the Becoming Your Best podcast. This is your friend and host Rob Shallenberger and excited that you’re able to join us today, wherever you’re at in the world. This is going to be a pretty short and hopefully quick hitting and powerful podcast, because I know it’s something that applies to every one of us to some degree. And before we get into what I wanted to bring up here on this short podcast, just a couple of reminders and invitations. Number one, if you haven’t already taken the Personal Productivity Assessment, make sure you go to our website, becomingyourbest.com, enter your email, and then take this assessment. It is a powerful predictor of long-term success. It shows you where you are today, specific ideas on where you can go and how you can get to the next level. It also shows you where everyone else is at, an average, and the top 10%, not that it’s a comparison. This is really about every one of us individually, yet sometimes it’s nice just to see where other people are at. So that’s number one. Take the Personal Productivity Assessment. Number two is for your longer range planning, our next Breakthrough Leadership Conference is April 25th and 26th. And if you don’t already have plans to come out here or send a member of your team, we invite you to look at your long range calendar and make this happen. So maybe it’s sending a family member, a group of leaders from your team. If you’ve already been once or twice, great. Sometimes the best lessons learned and biggest takeaways happen on the third and fourth time when people attend. So I invite you to put that on your calendar and set that date aside. Now, the intent of this podcast is to address a very real emotion that we all deal with to some degree, and that is fear. Yes, the emotion of fear. We all have it, it’s there, it’s real, we need to acknowledge it. What’s interesting about fear is, on one hand, it’s a protection mechanism to keep us safe. You know, we have a fear of heights. Well, that’s to keep our bodies safe. We have a fear of drowning, so some avoid the water. You know, there’s a fear of tight spaces. All of these are a safety mechanism. So the emotion is a real and quite powerful emotion. If you think about some of the things that you fear in your life or what would cause your palms to sweat, for everybody it’s something different. You know, whether it’s rational or irrational isn’t even the question at this point. And I know there’s been books written on this. So I’m going to just share a different angle to this emotion, and how to overcome and conquer and not so much conquer because it’s going to be there. This emotion of fear doesn’t just disappear. So it’s not just overcoming and “conquering it”, it’s how to overcome it in the face of it. It’s going to be there. So how do you make fear irrelevant in moving forward and progressing forward in our lives? So I want to share with you before we get started three brief stories to illustrate how real and powerful this emotion is, and then I’m going to share with you three tips on what you can do and what I can do to overcome and push through this very real emotion. So let me just share with you briefly these three examples. Just last week, we were down in Zion National Park in Southern Utah. And if you’ve ever been to Zion National Park, you know, it’s one of the most beautiful places on the planet. You have these massive red rock cliffs, and in this case it was a blue sky, so we had this blue sky background, even a little bit of snow up on top, because I mean these rise from like 3,000, 4,000 feet up to 9,000 and 10,000 feet in some places. Typically 8,000 feet will be the tops of most of them. So you’re talking about a fairly high level of elevation, and just this deep red rock canyons cut through these cliffs and it’s absolutely just stunning when you get out there. Well we’re hiking up this particular trail, it’s to an observation point, and as we’re walking up this trail…First of all, there’s some pretty fit people in the world. We got passed by a trail runner, and I thought, “Man, that guy’s a machine.” And there’s people in their 60’s and 70’s on this trail that I was so impressed with. Well, anyway, we’re hiking on this trail, and we’ve been going for about 45 minutes and then see switchbacks. And on the switchbacks, if you could visualize in your mind, the trails are about five or so feet wide. And there are a few places along the way where on the one side of you facing the edge, it’s a steep drop. In some cases, 30 feet, 40 feet. Even a couple of places where it was a few hundred feet. Now, as we’re talking about fears, one of my fears is a fear of heights. It’s real, it’s an emotion. You may say, “Well, how can you be a fighter pilot and be afraid of heights?” There was a statistic done, and I don’t know where this research came from, that suggested that 60% of pilots have a fear of heights. So there’s something about that. You know, who knows, but it’s there. And as we’re hiking up this trail, there was this one particular spot where we came up to a gentleman, and keep in mind, this is near the top. It’s not the end of the hike, but it’s when you go over the ridge to the top, and you can see that you’re really done with the steep ascent part of it. Well, as we near that summit part, and I look and there’s this one part where, yeah, it’s a pretty good drop off to the left, even to the point where my palms started sweating just a little bit. There was this gentleman in his, probably, mid-60s who was resting against the rock on his arm. He looked tired but it was more than being tired, and I guess that it was a fear of heights. So I stood there and I waited for our kids to catch up. Then there was another couple behind us, one of them asked him, “Hey, are you all right?” And he said, “No, it’s a fear of heights. I just can’t go on, I can’t go on.” And at that point, he turned around and started walking back down the trail. Myself, my wife and my kids walked another hundred yards, and this was literally only like a 5 to 10 foot section where there was a little bit of a drop off there on your left, so we got through it quickly. And after walking about another hundred yards, we rounded the corner and we were at the summit inside this whole new canyon that was absolutely pristine. It was green, it was beautiful. It emptied down into a slot canyon on our left. One of the most beautiful places I’d ever seen. You know, the second one I experienced myself similar rock climbing. We were down in Las Vegas, it was this red rock garden area and it was about 100 foot cliff as you scale up. Same, idea as Zion, it was this red rock cliff. My brothers and I, as we are rock climbing, and they all love rock climbing. None of them have any issue with heights. I’m the only one out of the brothers that is bothered a little bit by that. So my brother Tommy went and set the ropes up above, dropped them down and they started telling me, “All right Rob, you go first, you’re up.” And I thought, “Okay, great, here we go.” So I jump up, I hook in and have my harness on and I start climbing up the side. Well, no problem on the first 10, 15 and 20 feet. That doesn’t faze me. As I started to get to that 25 and 30 feet though, you know, that’s where you’re starting to get a little bit higher, where the stakes are a little bit higher. If you fall, you’re going to get hurt. Sure enough, the palms started getting a little bit sweaty and, you know, the heart starts racing a little bit. And anyone who has a fear of heights can relate to this, and whether it’s heights or water or, you know, whatever your fears are, you could probably relate to this. So as I’m getting to this point and I remember leaning on my shoulder and saying, “All right, this is good.” You know, “This is high enough for me. I’m going to turn around and go back down.” And they said, “No, come on, Rob. You can do it. A little bit higher.” I was starting to mentally check out and say, “No, I’m good.” And then my brother Steven yelled up and said, “Hey Rob, look up to your left about three feet above your head into your left there’s a nice little hand hold, grab that hand hold and you can pull yourself up.” Now ideally, you’re supposed to use your legs and push when you’re climbing, but at this point, you know, whatever. So I look up at the hand hold and I see it and I go, “Okay, if I go for that hand-hold, now, this is definitely not positive self-talk or anything close to it in here, I said, “I’ll probably fall.” So clearly not the right line of thinking. But that’s what my thought process was at the moment. And so I thought, “Okay, well, I have a choice. I can reach for the hand-hold and pull myself up or I can just give up and go back down. And I said, “All right, well let’s go for it. I’m on the rope, I’m harnessed in, this will be good. Even if I fall, they’ve got me, the rope is tight. So I made this reach and this pull, I extended my arm, got my fingers into this hand hold, held on and started to pull myself up. And boom, I just went another three to four feet higher right there in that moment. And I felt like I just had this huge internal victory because now I was higher. I had a new view and actually a lot better handholds at this point. And for some reason, I had just in that moment, conquered that particular fear. And I thought, what would have happened had I not reached my hand and maybe even if I would have fallen? The harness could have had me. Maybe it would have hurt a little bit. I could have got back on the rock and tried again. The point is, how many times in life do we not ever make the reach? How many times do we stop or say, “No, this is high enough?” And we don’t try to go any higher. It wasn’t until I climbed just a few feet higher that it was actually my favorite part of that climb and really opened up another vista that I couldn’t even see from just a few feet below. So again, there I was on the side of this rock face cliff, outside of Las Vegas, and it just dawned on me the power of this principle of never give up, and how it applies to fear and overcoming and pushing through a fear to get to what is so beautiful and amazing on the other side many times. Now, this last story has been one of the most impactful in my life and I have shared it once before on these podcasts. It’s something that happened in high school and as I share this one, I imagine that most of us listening can relate in some degree or another. So this was in high school. It was about 10th grade and I was wrestling. I decided to wrestle and I had an okay year. It was an average year wrestling. I won some and I lost some. Well that summer, I decided to put all my eggs in this basket. Go all in and I had a new goal to become a state champion wrestler. Well, throughout the entire summer, my dad was able to coordinate a friend of his to help me out and he happened to be the number two ranked NCAA wrestler at the time in his weight class. And so we got out on the mat and we would wrestle three times a week. He would teach me all of these moves, these new tricks and things that you can do. Then I’ll tell you what, my progress in wrestling just skyrocketed over the course of the summer. Now, this is back in the day when you didn’t have club sports, so you weren’t really doing things year round. You just would do the sport that applies to that time of year in high school. So at this point, everyone else who wrestled is taking the summer off and I’m down in this collegiate gym, just cranking it out on a daily basis by myself, and three times a week with our friend, Scott Eastman. So, roll around, fast forward the clock to November. High School wrestling starts again and just prior to it starting, I went out and wrestled a person who happened to be one of the best wrestlers on the team from the year prior and in about the 30 to 40 seconds I had lifted him, put him down on the mat and pinned him. He’s like, “Man, what in the world happened to you, Rob? You’re incredible.” All of a sudden, he started spreading the word and the coaches are like, “Oh man, you’re going to be a state champion.” And this was weird. This was a young 16, 17-year-old mind and I didn’t really know how to process this. Boy, I wish I would have known then what I know now. I started to get this weird line of thinking in my mind. And at 16 or 17 I started thinking this, man, there’s a lot of people here that are starting to cheer me on, what if I let them down? See how there’s the fear of failure that started to creep in here. Man, I’ll tell you, this was a real emotion for me. This was no joke. Everybody was, “Rob, you’re going to be a state champion. Man, you’re just killing it.” And there was some serious expectations that were being said and I thought, “I’m going to let a lot of these people down if I don’t become a state champion.” And so these weird thoughts started creeping into my mind about, well, what if I don’t wrestle anymore and then the rest of my life I could say, I could have been a state champion and I could always live in the what if, whereas if I press forward and wrestle, if I’m not the state champion, then it’ll be guaranteed that I wasn’t. See how weird that line of thinking is. But I’ll tell you what, it was very real to me at the time. I quit and I went with option one and said, “You know, I’m just going to quit and say, ‘I could have been’ the rest of my life.” I remember my wrestling coaches pulling me out of class saying, “Get your fanny back in here and start wrestling.” I wouldn’t do it and I didn’t do it. To this day, as I look back, that is one of my top three greatest regrets in life because I’m sitting here living in the “What could have been”, “what should have been”, and really that means zero because it wasn’t. So my son plays football now and my daughters clog and play soccer and we’ve had these conversations several times. And that’s why we’ve developed this model that when Shallenbergers start, we finish. Shallenbergers don’t quit. We can make smart adjustments but when we start we finish. And that’s our Shallenberger motto, and it all emanated from that 17-year-old wrestling experience that really, in the back of my mind, was just crushing that I didn’t finish that race. From that experience however, man, the lessons that were learned from that, “failure” because never again from that moment on have I started something and not finished it. I will see it through to the end now every single time. The point in sharing that story is not so much in the never give up part of the equation. It was at 17, I went face to face with a very real emotion of failure, and this fear of failure. That fear of failure became so powerful to me that it caused me to get sidetracked from what my goal had been to become a state champion. So I acknowledge, having seen this in others, having seen it in more than 200 organizations that I’ve trained, that this can be a huge impediment to our personal and organizational success. So the question is, how do we overcome fear? How do we face it head-on, acknowledge that it’s there and then press through it? Well, there are three things that any one of us can do. Number one is what you’ve heard reiterated over and over many times on these podcasts, and that is to have a powerful, personal vision that you know that is internal, that burns deep inside your soul, and it should be meaningful and give you direction. That’s what a powerful personal vision can do. Less than 1% of people in our population have a written, personal vision. Number two, is to put yourself in an environment, surround yourself with people who can help you succeed. When you put yourself in the environment where success can happen, whatever it is, it can help you address your fear or help you achieve your vision. You basically fast-track the process. Let me give you an example. How many times have we wanted to lose weight or eat more healthy? I think that encompasses most people with those two. How many times has it actually happened? Well, for a handful of people, it works out. For most people, it simply never leaves the intention phase. Yeah, I know I need to lose weight. I know I need to eat better. And that’s about where it stays throughout the rest of our lives. So the question is, once you have a personal vision that is powerful enough, surround yourself with the people who will help you succeed. Let’s just take this one that we’re talking about now: weight. It’s one the most people can relate to. So if you want to lose weight, if you want to eat healthier and feel better about yourself, start by finding a couple of friends who are where you want to be. I mean, just this morning, my wife and I were at CrossFit and a good friend of ours is healthy, lean, fit and she was talking about her diet and we said, “Hey, why don’t we have you and your husband come over and you can share with us what you do.” That doesn’t mean we’ll incorporate all of what they do and how they eat, but we’re going to learn some lessons that we currently don’t have. That’s the idea. Is to surround yourself with the people who are where you want to be. Let’s just stay on this topic, weight. Find out when they work out, how they work out. So at CrossFit, that’s an easy example whether you like it or not, doesn’t really matter. Take whatever it is and substitute with CrossFit. If they go to a CrossFit gym, ask what time they work out. “Hey, would you mind if I came at the same time?” “No, of course, come on.” See, all of a sudden, you’re surrounding yourself with the people you want to be like in certain ways in that aspect and it becomes easier and easier for you to face that fear. The fear of the start or the fear of the journey. And consider joining them in whatever they’re doing. You know, again, whether it’s CrossFit or running or biking. The point is that you’re surrounding yourself with people who are going to help you get there. Maybe it’s starting a new business. How much fear is there surrounding that? How many people have never started a business because they were scared to do it? You know I came from the fighter pilot world and it was interesting. Again, it’s very real emotion. There were a lot of people when I got out of the Air Force at 11 years said, “Man, you’re crazy. What are you going to go do?” It was really an irrational fear because there’s an incredible demand for leadership out in the world right now and there’s so many opportunities for fighter pilots. Yet when you’re in that world, you know, the fear is, what happens if I leave? What’s going to happen to the pension and what if I do that? Now, there’s some people who justifiably stay in because they love it and they are going for the 20 years plus and that’s awesome, that’s going towards your vision. But when we don’t move because we’re paralyzed by fear, that’s a different story. So find someone who is where you want to be, put yourself in that environment, attend a conference, learn how to do it. Learn how to do things that you’re currently not doing. These will all help us push through this real emotion. The third and final thing is very simplistic yet very powerful and that is to start. Simply start. Do something. Doing something is better than doing nothing. If you want to start a business, well, start by allocating one or two or three hours a week towards developing your business idea, your execution plan, your business strategy. At least you’re doing something moving you forward. As soon as we have a plan, as soon as we start to have a way forward, it’s amazing how it paralyzes the emotion of fear. And we’re like, “Wait a second, we can do this.” I was with an individual this week, great, great person. You know, kind of at a tough point in his life right now. And as soon as we had mapped out a plan together, he’s like, “Wait a second man, I see the way forward. I can do this.” So simply having that plan and starting and doing something suddenly starts to paralyze the fear that was paralyzing us in the first place. So I hope this podcast has been helpful. 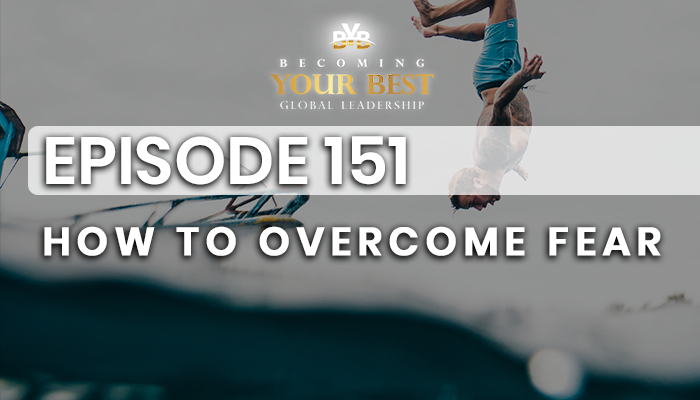 It was a quick 20 minute podcast acknowledging this real emotion that we all deal with to different degrees and levels and how do we overcome and push through this fear and make it irrelevant in our lives. It will be there, we acknowledge it, and then we set it aside and continue to move towards our vision, surround ourselves with people and the environment that allows us to overcome and conquer that. And then simply start and do something today that will help us move the journey. So if it’s weight, what can we start doing today that will start moving the needle? Anything is better than doing nothing. So hopefully, this podcast has been helpful to you in some form or fashion. If you’re driving to work, make your car a university. You’re probably listening to this somewhere in that form or fashion so congratulations to you. You know, you’ve got 20, 30, 40 minutes in your car each day, why not make the best of it and learn something along the way. So thank you for taking the time to listen to this podcast. It’s because of you that we do these in the first place. We would love to continue to hear your feedback. So just like I started the podcast, remember to take this Personal Productivity Assessment, it will help us see the way forward and then really consider attending this conference on April 25th and 26th out in Utah to jumpstart your success forward no matter where you’re at. It really doesn’t matter where we are today, whether we’re ultra-successful or whether we’re just coming from rock bottom. This will help take our good and make it better because these 12 principles are very specific, high performance habits that are great predictors of long term success. So I’m going to finish with this quote that I love. If you’ve been in a seminar, you’ve heard me say it and that is this, “One ship sails east and another west. By the self-same winds that blow, ’tis the set of the sails and not the gale, that determines the way they’ll go.” We all have the same wind at our backs and the question is how will each one of us choose to set our sails and will we catch the wind or will we not. This is Rob Shallenberger, hoping that you have a fabulous day and great week. Wherever you are at in the world, take care.